What an interesting weather day it was! There was no need of a jacket, and Ken even went golfing wearing shorts. That was before the golf course, across the water, was socked in with fog! Actually, this was when the fog was rising and the visibility was good again! Not a half hour before there was a blanket of white air between where I stood and across the way! From our porch, the view was clear down the street, but beyond was a blanket of white fog. It's just midnight, the end of this day, and the air has been still and so quiet. We're told that's all about to change...providing some different weather pictures in the days ahead! @bkbinthecity I thought the Canadians would appreciate this POV! Thanks! @panthora I was JUST about to shut down for the night when I got your always enjoyable note! This fog made me think of the times I've flown alongside a puffy cloud and I wonder what it would be like to touch it... On a day like today, I believe I did! I've never seen the view (awhile prior to this photo) totally disappear like that! The deck is nearly done; electrical needs to be added for lighting. Then trees reshaped...and a garden put in with plants that survive winter...and it should be lovely by the day we're ready to leave! I'll bet you're really enjoying your finished work! Like you and @panthora, I experienced rapid fog blanketing the coast when I was in Maine. It was incredibly just how quickly it (literally) blows in off the ocean. I feared for some of the boats but know they know what they're doing. It also brought immense relevance to the 67 lighthouses along the coast. Wonderful pic Louise! Great capture! I find fog quite scary! A great view and a beautiful capture of the lake , the hills and the boats. 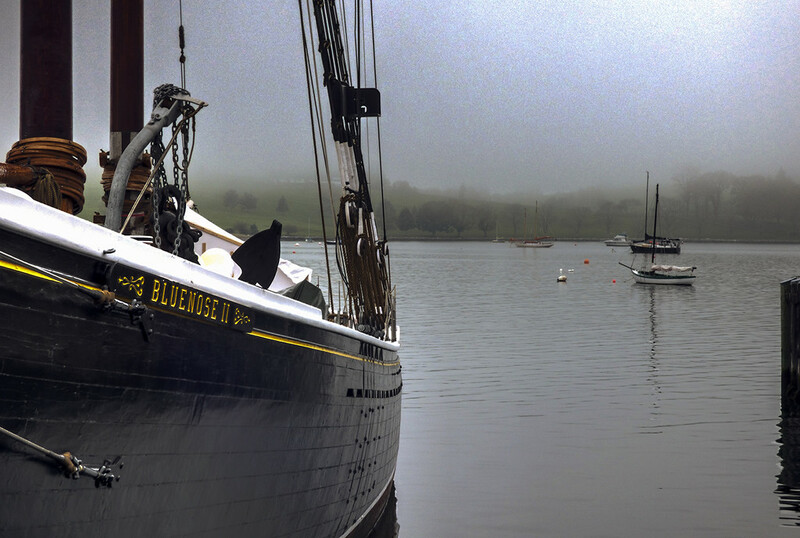 If you will do me a fever, send some more pic.`s of the Bluenose II. In my opinion: the most beautiful ship ever build. fog is always better if you have a foghorn blowing, not too many of those in colorado. @pyrrhula This "lake" is Lunenburg Harbour and the hill in the background is "The Bluenose Golf Course". Onyx17 (Marek) @onyx gave me some suggestions about using the widest bracketing possible, and though I've not come close to the possibilities he's shared, this was a first attempt and I can see the marvelous depth of colour that I'd not gotten before! I'm so appreciative for his assistance! His work is sublime! well, those are MY "best laid plans"! @voiceprintz It sounds to me like a Nova Scotia holiday would suit you nicely... Thanks for allowing this image to caress your fond memories! very nice. love the misty moody feel. Hurricane season is not fun, and living in Miami I can say it, but we have to do what we need to. This is a wonderful composition, love how you included the boat. The misty background is lovely. wonderfully composed! Such a great scene! @Weezilou Thank you dear Louise for the explanation and the link to onix 17. I`ve watch it and see what you mean. I often think about to join a photo club to improve my skills but I`ve less time and other hobby`s I prefer to do. You can`t have it all. that's a beautiful shot! i could just stare at this the whole day! What a wonderful place you have there to explore and photograph. Lovely shot and story to go with it. I love the POV with the boat in the foreground and the feeling of mist closing in! Love the eeriness of this shot. Fabulous pov with the detail of Bluenose leading you to the other boats and the fog closing in.